GradeHub empowers educators to grade answer sheets all within Canvas (see press release). The result is GradeHub provides you with a modern approach for processing answer sheets that will be welcomed by instructors and students. As you can see in the screenshots and video, our team went to great lengths to create an experience that is familiar, convenient, and powerful. Classes, rosters, exams, and grades are all automatically synchronized. We also designed the flow so that experience for your faculty is seamless. Instructors use their same test (probably a Word document), so the transition for instructors to GradeHub is effortless. That is it. GradeHub automatically creates answer sheets for all of the students in the class (i.e., your Canvas roster). 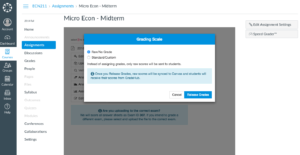 Before the exam, have students print out their GradeHub answer sheet from Canvas or instructors can print blank answer sheets too. Student answer sheets are prefilled to avoid mismarked student IDs. 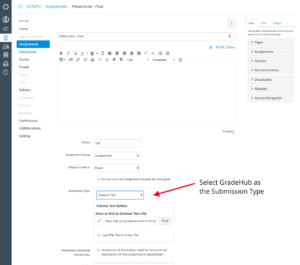 To print answer sheets, simply choose the “Assignment” in Canvas and select the PDF icon from GradeHub. After testing, collect the answer sheets just like scantrons. Bring the answer sheets to your exam scanning service or instructors can upload answer sheets on their own too. All you need is a regular scanner. GradeHub reads multi-page PDF files to score your exam. 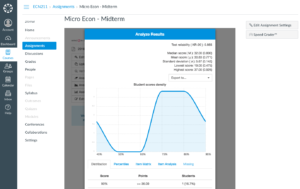 Instructors can analyze the scored answer sheet data all within Canvas. Teachers can view answer sheets, make changes, or update an answer key. Corrections made in GradeHub recalculate reports automatically. GradeHub provides exam statistics, percentiles, item analysis, and a missing student report, all available within Canvas. Once you’re satisfied with exam results, select the Release Grades button, and we automatically sync student grades to Canvas. Students love the feedback from GradeHub too! To learn more about how you can grade answer sheets all within Canvas, schedule a web demonstration. © Copyright 2017 GradeHub Inc.